I’m blessed to have had several such pastors in my life, though I realize such humility isn’t a given. The irony, of course, is that saying these things not only liberates a congregation; it also liberates the pastor. Often, the most meaningful and impactful words a pastor can share are spoken away from the pulpit. What’s something a pastor has said to you that was painful or destructive? What’s something a pastor has said to you that encouraged, healed, or inspired? I have never plugged another blog so vehemently as I am now plugging this one. My wife and I were up until 1:30 in morning, rolling in laughter at this blog because IT’S ALL TRUE!!! The author is not forthcoming with personal identity details, but that’s the blogger’s prerogative. The experiences chronicled and parodied here are almost universal among mainline clergy. I’m actually a little scared that if my parishioners found this blog, they would be able to read my mind. Please check this out, especially if you happen to be the clergy type. Pastors in several churches across the country wore hoodies to church last Sunday as a prophetic act of lamentation over the shooting death of Trayvon Martin. Himalayan shepherd. Image by Raja Selvaraj. The text is good old Psalm 23. Over the course of these past seven months, I’ve been getting to know all of you as I begin my tenure of service as your pastor. During that time, one thing has become quite clear to me: it’s been a long and hard road for you in your search for a new pastor. There’s been a lot of heartbreak and frustration. Mistakes have been made. New hopes have turned into false starts on more than one occasion. I know something about how that feels. Today, I’d like to share some of my story with you. I’d like you to know something of the road that has brought me to you at this particular time. I’ve had my own share of mistakes, heartbreaks, and frustrations along the way. But I’m sharing my part of this story because I believe that, in spite of all the setbacks, the Holy Spirit has brought us together at exactly the right time. 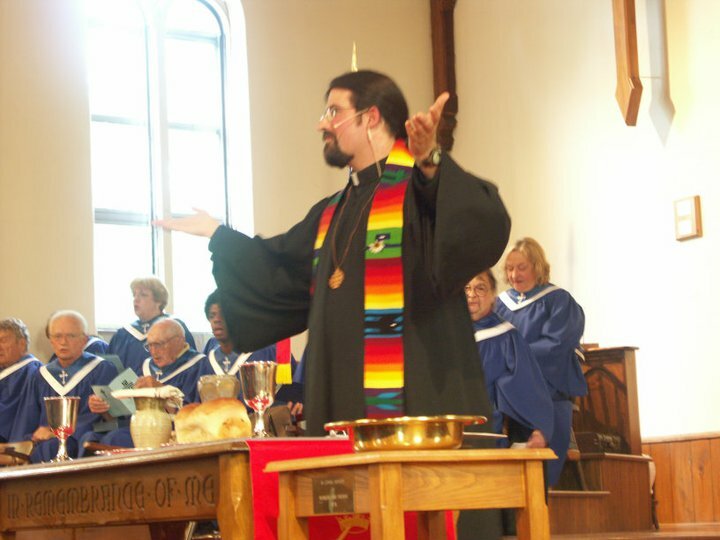 As most of you already know, I began my career in ministry as an Episcopal priest. The denomination I served was not the large mainline Episcopal Church that most people are familiar with. (In other words, it was not the same denomination that’s associated with our good neighbors down the road at Trinity Episcopal on Schuyler Street.) I served a small independent group that was founded as a separate organization about ten years ago. Out of respect for that church and the people in it, I won’t be naming any names this morning. I was initially attracted to their ministry ideals and their commitment to serving the poor. But I discovered in time that a denomination that small comes with its own set of problems. The top-down hierarchy meant there was little accountability for those at the top of the organization. Sadly, abuse of power was bound to happen in that kind of situation. And it did happen. It would be inappropriate for me to go into gruesome details about the nature of the abuse, suffice to say that it eventually reached a point where I found it personally and ethically impossible for me to continue serving as a priest in that church. So I made the decision to leave. This was the hardest decision I have ever had to make. Years of prayer and preparation had gone into my process of ordination to the priesthood. The decision to serve that church was not one I made lightly or rashly. The decision to leave was even harder. I consulted several trusted friends, family, and professionals. I went through some very long days of struggle and self-doubt about my sense of call to the ministry. Yeah, it felt like I was walking “through the valley of the shadow of death”. Not my physical death, but the death of my dreams, the death of certain close relationships in my previous church, and the death of my plans for the future. Yes, I’ve been through that valley. I know you’ve been through that valley as a church. I also know that many of you have been through that valley as individuals. So, this morning, I’d like for us all to keep our own personal experience of this “valley of the shadow of death” in mind as we explore the 23rd psalm. First of all, this is one of the most famous passages in the entire Bible. I had us read it together this morning in the King James Version because that’s the version in which most people are used to hearing it. The language may sound archaic, but to many of us, it’s also comforting. Obviously, the language of this psalm paints a picture of God as the Great Shepherd. Shepherding was an important job in the ancient world. Livestock was a measure of one’s wealth in those days, much like an investment portfolio is for us today. The richer you are, the more you need a shepherd’s help. Ironically, the shepherding profession itself was not held in high esteem. Shepherds were thought of as dirty hillbillies. This was not unusual in ancient agricultural societies. More “civilized” farmers who settled down and established a homestead on a particular piece of land often looked down on the nomadic shepherds, who had to travel wherever there was sufficient pasture and water for the sheep. Farmers spread lots of nasty rumors about shepherds. In fact, this farmer vs. shepherd rivalry is so long-standing, some biblical scholars think it may have been the inspiration for the legendary Cain and Abel story in Genesis 4. These two brothers were the first sons born to Adam and Eve after their expulsion from the Garden of Eden. Cain, the elder, stronger, and more “civilized” brother was a farmer, while Abel, the younger and weaker brother was a nomadic shepherd. I could go into more interesting detail about their story, but that would be an entirely different sermon. For now, it helps us to see that shepherds were looked down upon in the ancient world. What does it mean that God was identified with this necessary-but-despised profession? I like to think it means that God, the Great Shepherd, isn’t always present to us in ways that are nice and pretty. Sometimes, God seems to be very “rough around the edges”. This makes me think of the character Strider in J.R.R. Tolkien’s classic, The Lord of the Rings. Strider is a dark and mysterious wanderer. Nobody knows if he can really be trusted, but it turns out that he is actually destined to be a great king over the land of Gondor. In spite of his rough appearance, Strider is one of the most noble and trustworthy characters in the book. I think that God, the Great Shepherd, is quite similar to Tolkien’s Strider. As Psalm 23 progresses, we learn more about God’s job as the Great Shepherd. We learn first that the Shepherd is a Guide. The flock is destined for “Green pastures” and “still waters”, places of rest and refreshment, while they walk with God. Even in the darkest valley, the sheep are never alone or abandoned. Their final destination is the place where God lives, the place where a home has been prepared for them by the Shepherd. The second thing we learn is that the Shepherd is a Guardian. The “rod” and “staff” mentioned in verse 4 are actually weapons used to fight off wolves that might try to attack the sheep. As flocks of sheep wandered through the wilderness, they would often have to worry about predators that might be stalking them from behind. Who knows what kinds of dangerous and wild animals might be following the flock? But the sheep says in verse 6 the Great Shepherd is so good at the job that only “goodness and mercy shall follow me all the days of my life”. No wild animals here! Third, we learn that the Great Shepherd is a Host. The sheep says that the Shepherd “preparest a table for me in the presence of mine enemies”, therefore “my cup runneth over.” The nomadic life of sheep and shepherds often looked unstable to outsiders. They had little control over outward circumstances. How could one know whether there would be sufficient food or water at the next stop? I’m sure it was nerve-wracking. Faith in God’s providence for our lives can be just as unsettling. We never know whether feast or famine lies around the corner. It feels more sane and stable to trust in the fragile and fabricated security systems of wealth and power in our society. But the fact is that we cannot effectively “insure” our health, life, or property any more than helpless sheep can safely find their own way to food and water in the deserts of Palestine. We need a guide and provider. Will we trust the Shepherd to do this for us? Fourth, we are told that the Shepherd is a Healer. The sheep says that the Shepherd “restoreth my soul” and “anointest my head with oil” (a common medicinal practice in the ancient world). 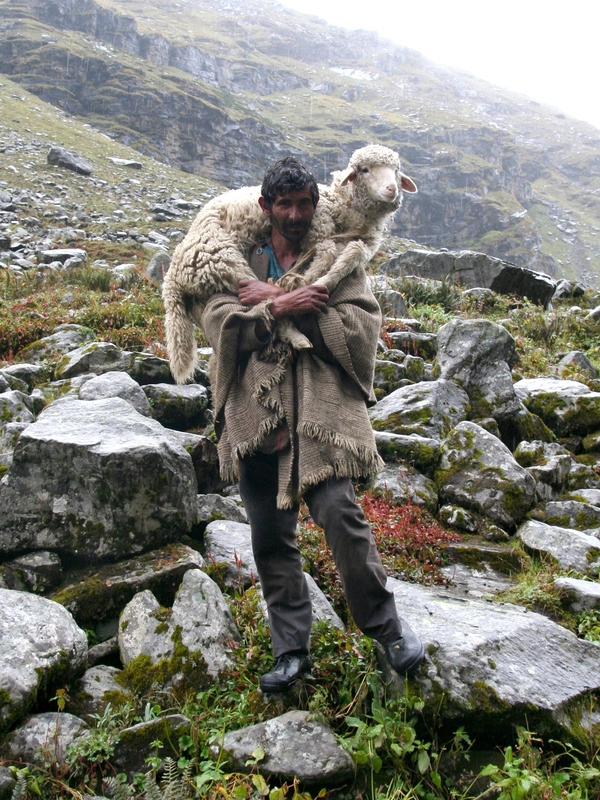 Tending to sick and wounded sheep was a big part of the Shepherd’s job. More than anyone else in this room, I’m sure our veterinarian friend, Terry Hausserman, could tell us detailed stories about animals in need of tender care. God promises to do this for us. After I decided that it was time for me to leave my previous denomination, I made a call to my friend Naomi Kelly, who is the co-chair for the Committee on Ministry in this presbytery. I explained the situation and she was sympathetic. It would be an understatement to say that these colleagues received me with open arms. The committees and the stated clerk of presbytery literally bent over backward to welcome me as one of their own. It didn’t happen overnight. Paperwork and exams were involved. There was also the issue of receiving a call. In order for me to come on board, I would need to receive a pastoral call from a congregation. Well, it just so happens that, the next Sunday after my initial phone call to Naomi, I was scheduled to preach here in Boonville. My decision to leave my previous denomination was so fresh, I wasn’t yet talking about it to anyone outside of my inner-circle of close friends. I came here that morning and did what I always do. But then, after the service, a group of elders basically cornered me in the sanctuary. “What will it take,” they said, “for you to consider coming here to be our pastor?” Let me tell you, I was totally blown away. There was no way that any of these folks could have known about the decision I had just made in the previous week. How is it that they picked that exact moment to approach me about becoming the pastor? I wanted to come right out and tell my whole story right then, but prudence dictated otherwise and I simply said that we should consult the presbytery’s Committee on Ministry and ask for their guidance. But there was obviously someone bigger than a committee that was guiding us in that moment. In spite of the dire circumstances of that “dark valley”, I can honestly say that I have never in my life felt so clearly the presence of God the Great Shepherd as Guide, Guardian, Host, and Healer than I did in that moment. Even as God was leading me away from an unhealthy situation, God was also leading me toward this new future in ministry. God’s timing was impeccable. So yes, I’ve been through the “valley of the shadow of death”, but I also know that I need “fear no evil” for the Great Shepherd is with me. Throughout my ordeal, God has been my Guide, Guardian, Host, and Healer. I can see the hand of the Great Shepherd at work in the life of this congregation as well. Yes, it’s been a long and hard road in your search for a new pastor, but you’ve never wandered alone or abandoned. In fact, you’ve always had what you were looking for. Did you know that the word “pastor” is actually Latin for “shepherd”? You’ve been searching for a new pastor, but all along you’ve been under the care of the Great Shepherd (the Great Pastor). In a very real sense, I’m only serving this congregation as the “assistant pastor”. It’s not my job to guide, guard, host, and heal you. I’m here to help you look for the ways in which God is already doing those things. “The Lord is my shepherd; I shall not want”. God has been your pastor all along; there is nothing you lack. And let me tell you, as a pastor, God is a tough act to follow! As you sit here this morning, you may be walking through your own personal “valley”. Maybe it’s the loss of a job, a relationship, or your health. Your circumstances will inevitably be different from mine, but the question is the same: Can God be trusted as Guide, Guardian, Host, and Healer? I invite you to look around in your present situation. See whether God has already been present and active in these ways. Also, I invite you to be patient and see what might be coming around the bend. Ask God to show you these things. As Jesus promised, those who seek will find. And those who trust in the Great Shepherd will dwell in God’s house forever.